Highlight of the Night: Wil Nieves and Dexter Fowler went back-to-back today at 8-9 in the order. I wonder if that's first for the Rockies? Outman went into the 5th inning with 69 pitches and an 11-1 lead. 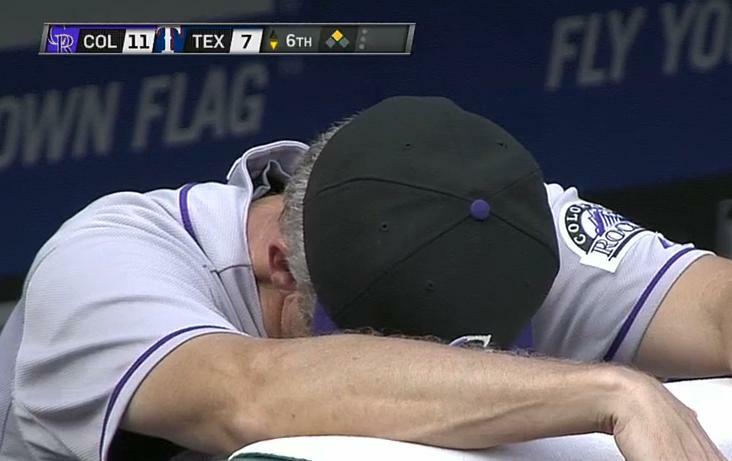 Only in the baseball world created by Jim Tracy could that inning be so stressful for the starting pitcher. Only in the baseball world created by Jim Tracy could that situation turn into as big a mess as it did for the Rockies. Jim Tracy allowed Outman to go well beyond the new 75-pitch limit for a chance to qualify for the win. I had no problem with it, honestly, because duh, you leave that pitcher in 100 times out of 100 on a normally run baseball team. But did Outman know going into the inning that Tracy was lifting the pitch count? Probably, but I don't know for sure. And even if he did, he probably wouldn't have known how long his leash was. Should it have mattered to Outman? Well, it's easy to say no, but what pitcher with a brain and a little pride wouldn't want to see a number other than 0 in the W column. Of course Outman was thinking about it. Of course the Rangers were seeing him for the third time as well. That certainly didn't help, but this fricking pitch count is making the already physically, mentally and emotionally draining game of baseball even more so for our starting pitchers. That's undeniable, unless our starting pitchers aren't human. The manager's job is to help alleviate that stress and to take as much thinking out of the game as possible by putting the players in the best possible position (physically, mentally, emotionally). Unless, of course, the manager himself is not human. Which is certainly debatable in our case. Personally, I don't care if Outman racks up a win. My main concern is the Rockies getting a win (which they thankfully did), but there should not have to be debate or decision about leaving him in past 75 pitches. There also shouldn't have to be debate or decision about removing him at 92 pitches when he'd clearly hit the wall. But there was, because when will Josh Outman ever have this good a chance to win a game with a 75-pitch limit? I'll answer that. He won't. Doesn't mean he won't stumble into a win, but under this system this was as close to a layup as he'll get. He just missed the layup because he heard footsteps the whole time. All of this nonsense is created by the pitch count. It's making all of us so much dumber as baseball fans, because just look at all of the pointless debates it created. It's also making the game so much more difficult than it needs to be on so many levels for the people on the field. God, I just want to root for a real baseball team again with real leadership and just a smidgen of logic. Is that too much to ask? What's Next: Suddenly the Rockies have a chance to win this series in Texas. And why the hell not? Alex White (2-5. 6.06) vs. Matt Harrison (9-3, 3.41) is the pitching matchup. First pitch is an unusual 5:05 for a Sunday afternoon. Final Thoughts: Rangers fans were booing the home team's performance today. That was a surreal moment and could very well be the high point of the season for the Rockies. I might not be kidding, either. Well said. You said everything I feel like I couldn't put words to. This is simply getting ridiculous.